We've really been loving all the delicious summer fruits available right now, and blueberries seem to be the favorite. My grandchildren have been eating them for breakfast with their cereal, as a snack with yogurt, or just by the handful. They are a superfood, so I love seeing them enjoying something that is so healthy for them. 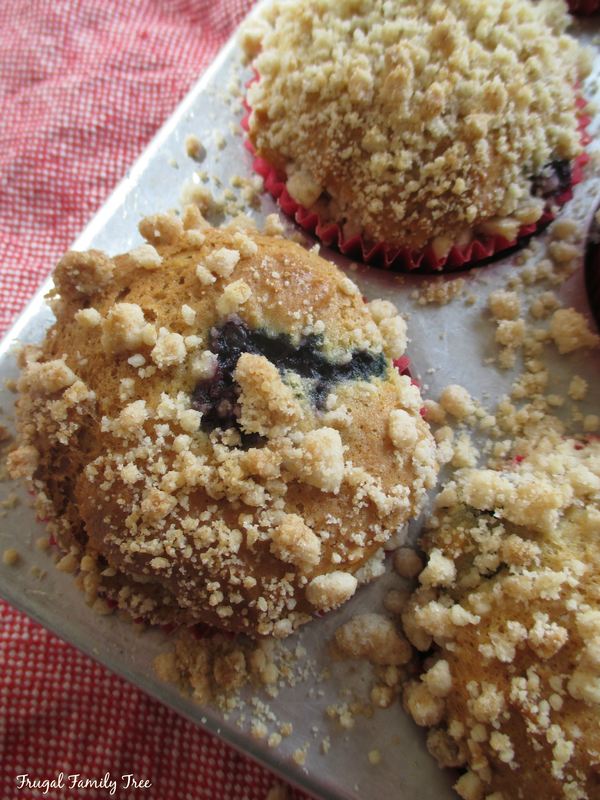 Since I adore muffins for breakfast or as a treat with a cup of tea, I thought I would use some of these berries to make Blueberry Crumb Muffins. They turned out delicious, and though I love regular blueberry muffins, these were extra good because of the crumb topping. This recipe makes 12 muffins. You can use regular milk if you don't have any buttermilk in the fridge, but I always think that baking with buttermilk makes everything just taste better. Can you believe that August is already here? It always seems like there's plenty of time to enjoy the summer days, but then somehow I find myself asking where all the time went. Pretty soon my grandchildren, just like my own children did so long ago, will head back to school. They say that when you are raising children the days are long, but the years short. This is so very true I think, and I'm trying to soak up the memories of my grandchildren because I don't want to forget anything about these summer days with them. 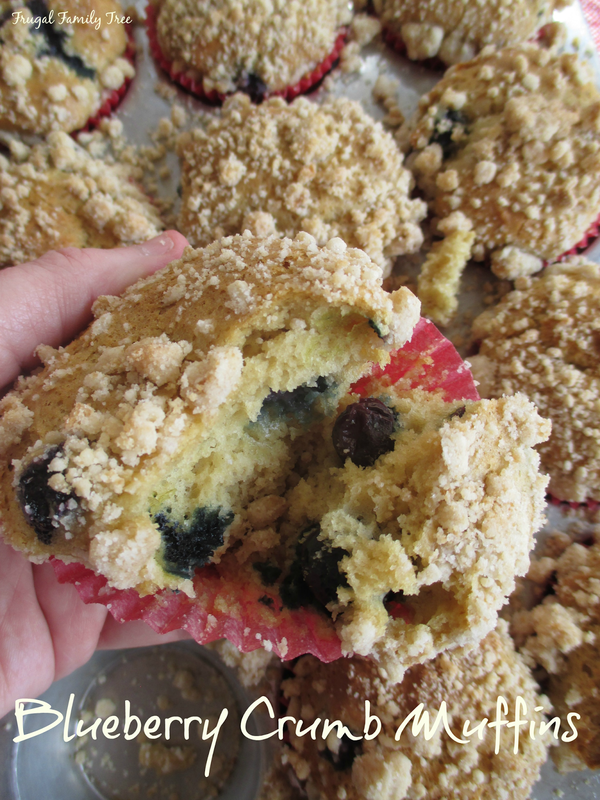 So of course when they tell me how delicious these blueberry muffins are, it makes me happy. Preheat oven to 375 degrees. Place 12 paper liners into muffin tin. To make the crumb topping, place flour, brown sugar, and cinnamon in a small bowl and mix together with a fork. Add the diced cold butter and blend briefly with a pastry cutter. Set aside. In a large bowl, whisk together the flour, sugar, brown sugar, baking powder, and salt. In another bowl, whisk together the melted butter, eggs, buttermilk, and vanilla until well combined. Add the liquid mixture into the dry ingredients, stir together until just combined, gently fold the blueberries into the batter. 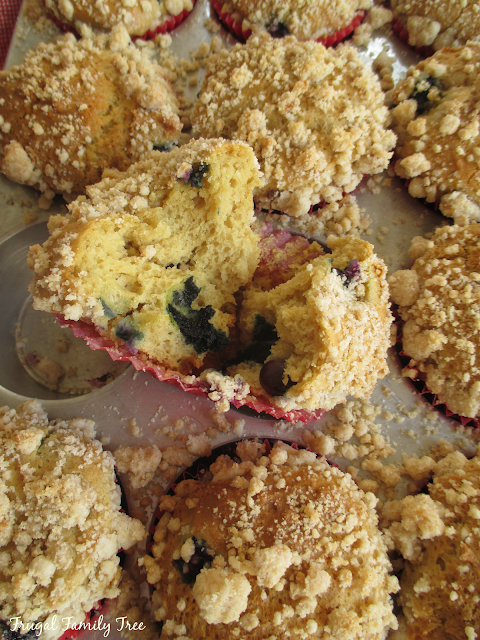 Divide the batter evenly into the muffin cups, sprinkle topping over each muffin. Bake 20-22 minutes, or until a toothpick inserted into muffin center comes out clean. Let muffins cool on a rack.